I would like to suggest “positive pregnancy test” and “gave birth” buttons. I love this app. It is very useful. It helps me to keep track for when I go to the doctor. And for future reference. Love love love this app but I haven’t been able to open it since Sunday don’t know if it’s just my phone or if it’s the app. Please help! Thanks on advance! Hi.My name is Eshve.I’m from Iran.I have a question.How can get pro version?Please help me.Thanks. Can I import my previous markings and all to a new phone? Ever since I updated the app last fall ( I believe) I’ve had an issue with the ads. An ad will pop up but then the screen goes blank and the app freezes. I don’t mind the ads but it’s frustrating when it keeps freezing up the app. I really like the app and all it features. I thought it was an issue with my old phone but I’m having the same issue with my new phone. (Both iPhones ) can something be done to correct this. 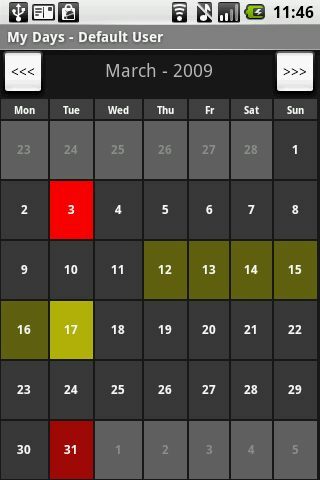 I’ve been using this app for two years, one pregnancy and plan to use it again to get pregnant again. As of now I can’t get into the app at all and I’m hoping I didn’t lose all my info. Thank you. there will be an update soon with a fix ! Is there an Ad-free version? Nice app. I found what i needed! Thanks! I have used this app since after my daughter was born in 2009. I like that there is now a pregnancy mode (although I am done having kids) they didn’t have that when I was pregnant with my last. 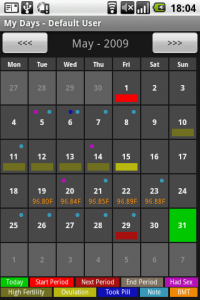 I do miss having the option to customize my calendar the way I want with the colors I like. It’s a great app, so keep up the good work! Why is the information different between iPad app and android phone app? Which one can be followed? Very nice app.It is very helpfull for us women. I love this app. I recommend it to all of my family & friends. What happened to the widget that counts down until next period? It is no longer available in my Galaxy S4. How can I get it back? Hi, thanks for this great app. It is very useful! I’ve heard so much about this app b4 I even downloaded it from my Daughter’s & Sisters (& I’m from a large family) this application is quite detailed and very precise. Thank you so very much for listening to your wife! 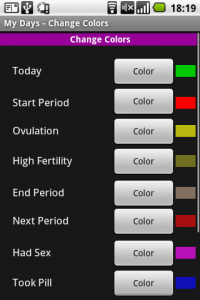 Can you allow the color code of ovulation days to stay, instead of disappearing when it’s completed? We have been TTC since Oct. Thanks to your app we got our positive pregnancy test on Friday! !! So excited I found your free app! I love this app! Definitely give it 5 stars! Im just confused as to how to use the body temperature. Any help? Thank you! Hi, we are TTC, and this app is great! I have between using this app for just under a month, and already learned so much about my body and cycles that I never realized. 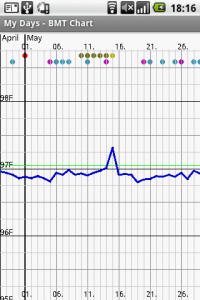 I am curious to know if there is a way to manually adjust the ovulation dates, my bbt and ovulaton tests indicate I don’t ovulate on the date indicated on the calendar. Can this be adjusted somehow? Great app!! I love it.. Thanks to the creator of the app.. My best wishes in your work man..
us there any way to use it on PC? Ich bin so froh, das es diesen app gibt! Ich bin naemlich sehr schlecht darin mir zu merken, wann ich meine tage kriegen muss und wann ich sie das letzte mal hatte! Danke fuer diesen app!!! Juss love his WEB SITE!!!! I love this app. 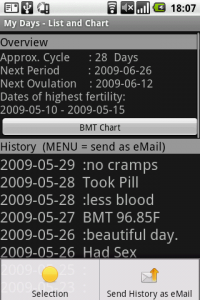 Keepin track of my cycle has never been easier and more consistant. This is hassle-free. Thanks Chris! How do u transfer this app to a different phone and still have all your information…. I want to know how to move data from old phone to new one. I don’t want to lose those 26 months of data!